Made my bosses & coworkers goodie bags full of candy. Then told them I was quitting. My coworkers & I quit as a group. We told our boss off & then left together in a limo we had waiting for us in the parking lot. When I was a Pizza Hut driver, boss wouldn’t let me take lunch break so I ordered Domino’s & they delivered it to me at Pizza Hut. Quit 1st job at ice cream shop bc I had to wear all white & ponytail. Later became a nurse and had to wear all white & ponytail. My boss was mean to everyone. Walked in her office to quit. Didn’t have to tell her. She was dead in her chair. No one grieved. I tried to make a dramatic exit at a restaurant job. On the way out I ran into the glass door and knocked myself out. “I was caught smoking a joint. My boss said, “you wanna work or smoke pot all day?” Easiest decision I ever made. My Coworker took everyone’s order for coffee shop then never came back. People were More concerned about where their coffee was. I left peacefully and amicably. I was so proud of myself! Then I used the restroom on my way out and clogged the toilet. I looked my boss dead in the eye and shouted “I hate this job and I hate all of you!” Then I ran away crying. I didn’t show up at work. They called and asked where I was, I told them job hunting and hung up. My boss called me “la menteuse” (the liar) to her husband, not knowing I spoke French. I told her I was not a liar & walked out. While picking beans on a hot summer day, I made an escape plan. I picked a direction and ran. I do this every time I change jobs: I take my business cards and shuffled them in to the middle of all my coworker’s cards. I called my boss on April Fools Day and said I wasn’t coming in. He thought I was joking, I wasn’t. I took my boss to lunch, then I asked her to pay the lunch bill because I’d be broke starting the next month. While on a field trip in a dense forest, escorting 20 kids, got news that I got the job I WANTED. I hope the kids got back okay. I bought everyone ice cream except for my boss. After work I said to my boss “I think I made my point.” and never returned. Walked into Boss’s Office. Removed Pan-Flute & sheet #music from backpack. Played Johnny Paycheck’s, “Take This Job and Shove It”. My friends, dressed as CIA agents, ran in my office yelling “We finally got you!” and chased me out the door. I never went back. A friend called corporate and complained on herself so she would get fired. Went to pick up my manager’s daily Starbucks. I had the barista write “I quit” as the name on the cup. I delivered it and left. A co-worker of mine got arrested at work while waiting tables. I went to bail him out instead of showing up for my shift. I was at work and extremely sick. Boss came by and I asked if I could leave, she said no. I threw up on her and left. What’ve you got against the Navy?” “Nothing big–but I’ve got soooooo many little things.” Grandpa quitting naval service. Working at a bakery, I spilled all the sprinkles, made a sprinkle angel and left. I once worked as Santa’s elf in a mall, I told Santa for Christmas I wanted a new job. I went for break and never came back. New guy at the office. on his first day he went out to buy lunch and left a voicemail saying he had found a new job. 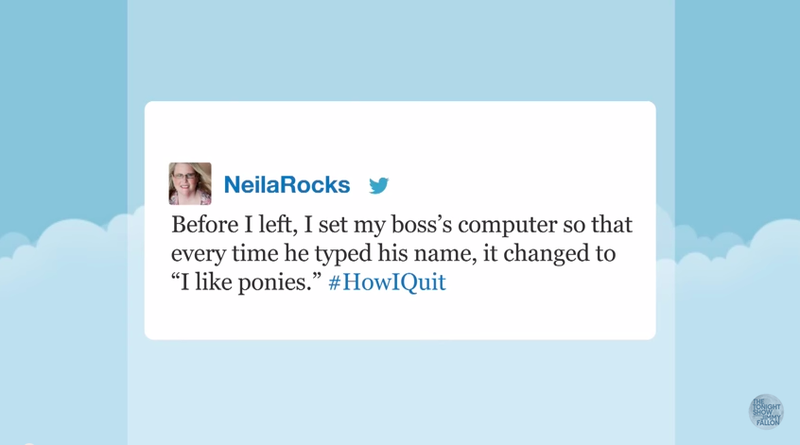 didn’t tell any coworkers when i quit. Everyone thought i hadn’t been scheduled in a while & kept asking me to cover their shifts. Made my boss think his wife had set up a “romantic scavenger hunt” on Valentines Day. While he was chasing “clues”, I left. I once was told to mop a floor again for the 4th time. I spelled “You mop it” in soap and left.